Every once in a while there seems to rise a special person, someone who almost single-handedly changes the cultural face of an entire region, but who at the same time manages to maintain a simplicity and humility that can only be admired. One of these people was Manuel Salustiano Soares from the city of Recife, capital of the North-Eastern state of Pernambuco in Brazil. The local population endearingly calls him "Mestre Salu." All of these rhythms have a deep connection with Afro-Brazilian traditions, with the struggle against slavery, and with the candomblé religion. And arguably, to a large degree this revival of ancient traditions can be traced back to one man, Mestre Salu. 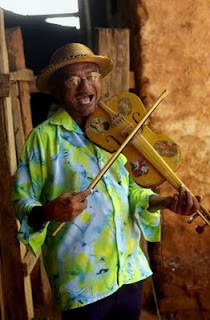 The Mestre played the rabeca, a rustic type of violin. The singer holds the rabeca against his breast (not the chin), and plays more or less in unison with his own singing. Mestre Salu transformed his own house into the Casa de Rebeca, a meeting point where all kinds and flavours of people from the popular neighbourhoods would meet, chat, play and exchange ideas. And I can guarantee that going to Casa de Rebeca in Olinda (now a cultural site recognized by Brazilian government) is still a recipe for a great party! Mestre Salu was especially active in promoting maracatu rural and cavalo-marinho groups (the latter style uses the rebeca intensively). Later, people picked up on his ideas and enthusiasm and started forming groups of coco, afoxé, baque virado... These rhythms can be heard everywhere in Pernambuco, building up to an orgasmic climax at the carnival of Recife and Olinda. In all of these cultural manifestations, Mestre Salu is still fondly remembered, after he sadly passed away in 2008 at the age of 62. Music never stops to evolve, and new exciting groups arose that started to mix these rhythms, also throwing a bit of rock, funk or hip-hop in the mix. Best known is the group Nação Zumbi, who irreverently planted an antenna in the mangrove swamps with their mix of maracatu, coco and heavy funk. 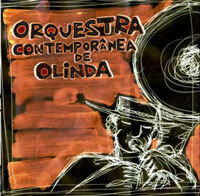 Today however, I'd like to point your attention to Orquestra Temporânea de Olinda. Their trombonist is somewhat of an acquaintance of mine from the cultural scene of Pernambuco, but I hope you'll like the music independently of that. Founded in 2006, the band brings us the impressive brass section of frevo, the beautiful melodies of the rabeca, mixed with some cheerful party-style ska. A delight to the ear. One of their singers is called Maciel Salu. Exactly ... a son of the Mestre. The band already gained recognition abroad, when the New York Times wrote a piece about them in 2008, and when they were nominated for a Latin Grammy in 2009. They played gigs in New York City and in New Orleans (where undoubtedly they fit right in). They released a great self-titled album in 2008, from which I'd like to present the track "Balcão de Venda." Here, the rabeca is combined with a thumping tuba to provide a rhythmical, upbeat party immersed in a bath of tradition. Exactly what Orquestra Contemporânea stands for. And in this kind of music, Mestre Salu still lives on.